I, like most cyclists have a favourite tyre, a tyre which I can rely on. I’ve recently had to dump my front schwalbe one, as I found a sidewall split that left me doubting the safety of that tyre. But the only spare 25mm tyres I had where Rubino.. However, this isn’t a bad thing. While they are not as fast as the schwalbe one, they are a lot more durable, and more of an all round tyre. Durability is an important consideration for me. While I don’t rack up anywhere close to the same amount of miles that some people do, I like to have a thought of set and forget, just letting the tyre get on with what it has to do. 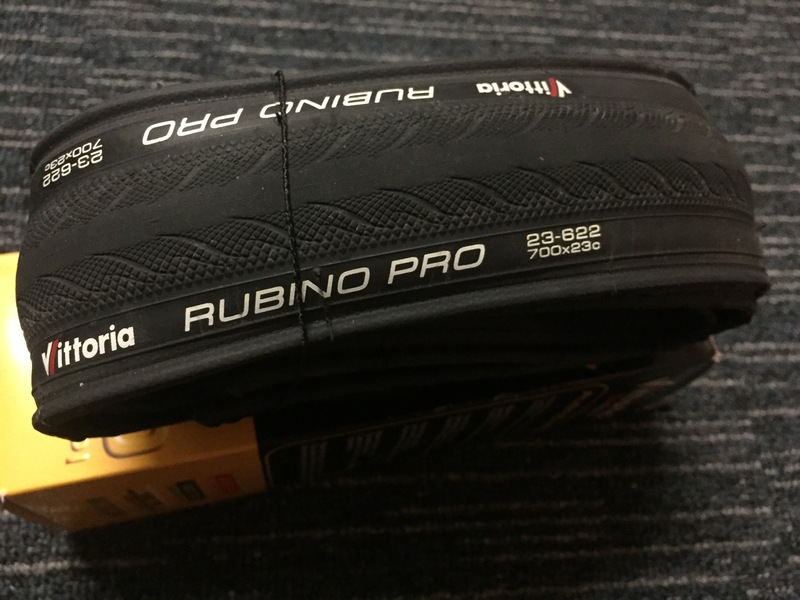 I know some would be immediately turned off by the fact that the Rubino tyres test slowly, but as a training tyre it is acceptably fast, especially considering the high levels of feedback given by the tyre. It’s not anything groundbreaking, and there’s substantially less grip than a pure race tyre (I’ve worked that out the hard way…). However, the Rubino Pro 3 does offer a huge increase in puncture resistance and durability, and demonstrates that durable tyres don’t necessarily have to be ‘dead’. As a training tyre, which might get raced on (as a spare wheel on race day) it offers acceptable speed, and dependable puncture resistance. Flexing the casing with my hands reveals a decently supple casing. Again, it’s not very soft compared to high TPI open tubular tyres but it does offer a similar degree of flex compared to Michelin Pro 3 race tyres. This correlates well to how they feel on the road, around the same ballpark as the Michelin Pro 3 tyres. If I had to use only one word to describe this tyre, that word would be ‘compromise’. It represents the middle ground, a reliable training tyre, which you can set and forget on your training wheels. If you don’t have the luxury of having multiple wheels, or the time to swap to a nicer set of tyres before race day, I’d be more inclined to recommend the GP4000s. If you’re not racing, or have a dedicated set of race wheels, the Rubino Pro 3 can do everything you ask of it in-between races. Whether that’s a long solo training ride, or a fast group ride the Rubino Pro 3 offers an excellent blend of durability and liveliness. In my humble opinion, I see the Rubino tyres as a great training tyre. However, it isn’t for everyone. It’s durable and offers good feedback, but by no means is it fast compared to out and out race tyres. If you’re able to accept the durability of the faster race tyres then these tyres don’t make a particularly strong case. It’s only when you find the durability of these race tyres lacking do the Rubino pro tyres make a strong case. What they don’t have in pure speed, they make up for in durability. As a high mileage training tyre, this has got to be one of my favourites.